Uncared for parks demonstrate that municipal trash pick-up isn’t enough. So, in addition to the materials, and the foresight, we need to also design for engagement; community building is a social and spatial problem, and creative design can aid the rigorous community organization of so many neighborhood leaders, activists, and planners. Collective social consciousness of waste, sustainable resources, economics, and pollution have influenced stakeholders to take a broader view of many design professions, especially architecture, which uses the greatest amount of resources of all human enterprises. Indeed, LEED (the Leadership in Energy & Environmental Design) helps establish standards of responsible resource making and gathering at the onset of design, while the temporal scope of architecture has also expanded beyond the finished building; design professionals need to take responsibility for the future maintenance and, even, potential disposal of the structure. Maintenance of a private residence requires the ultimate initiative of the owner; for public projects, the community is tasked with ongoing stewardship. 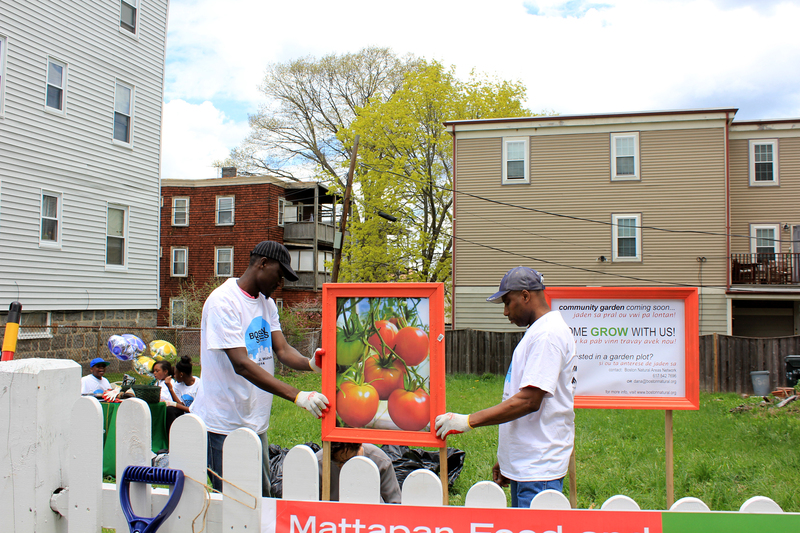 My non-profit, Salem Public Space Project, designed a tactic for engagement on May 3rd in Mattapan in collaboration with the Community Design Resource Center (CDRC), Boston Natural Areas Network (BNAN), the Mattapan Food and Fitness Coalition, and neighbors. We re-used four bright orange frames initially created for another project in Salem: Framing Lafayette Park. 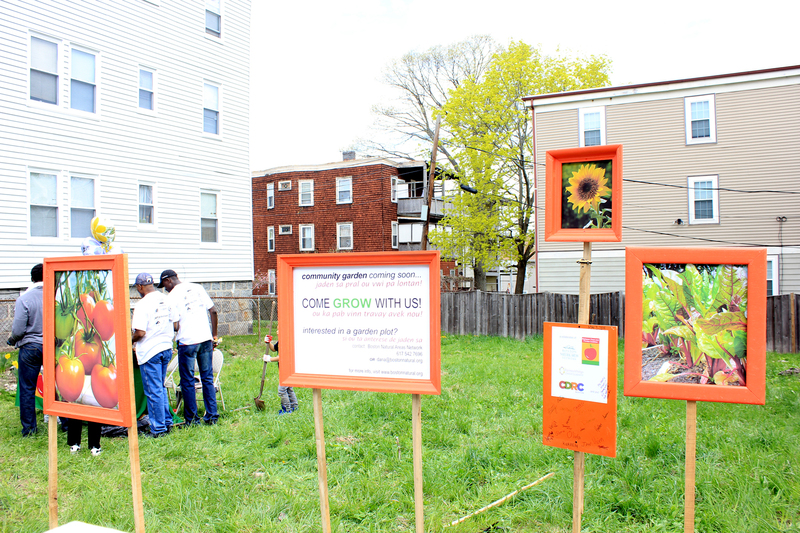 In tandem with the “Boston Shines” city-wide clean-up effort, we erected creative signage on the lot to communicate the message that the planned community garden needs more gardeners. Design for social engagement is a compelling design challenge; the project is often a temporary installation, with no budget, infused with contextual issues and histories, inherently political, that seeks to reach a diverse number of people in circumstances that often hinder civic participation. On the Woolson Street lot, while volunteers cleaned up trash and weeded around daffodils, we posted signs that signal the beginning of the transformation of a lot that has a history of tragedy, and a desired future of community, safety, commemoration, and beautiful gardens!